The Purdue Aphasia Support Group meets once a month for guided conversation practice, education, resource sharing, and connecting with others. Both persons with aphasia and their caregivers/loved ones are invited to attend. The Aphasia Support Group is led by Emily Bauman, MS, CCC-SLP, Michelle Gutmann, PhD, CCC-SLP, and Graduate Student Clinicians from the Department of Speech, Language, and Hearing Sciences at Purdue University. See the flyer below for more details. Follow us on Facebook for updates about our research studies, programs, and opportunities for individuals with aphasia. Read about the Purdue Aphasia Group in past newsletters. The Purdue Aphasia Group is a collaboration between the M.D. Steer Speech and Hearing Clinic and the Aphasia Research Laboratory. 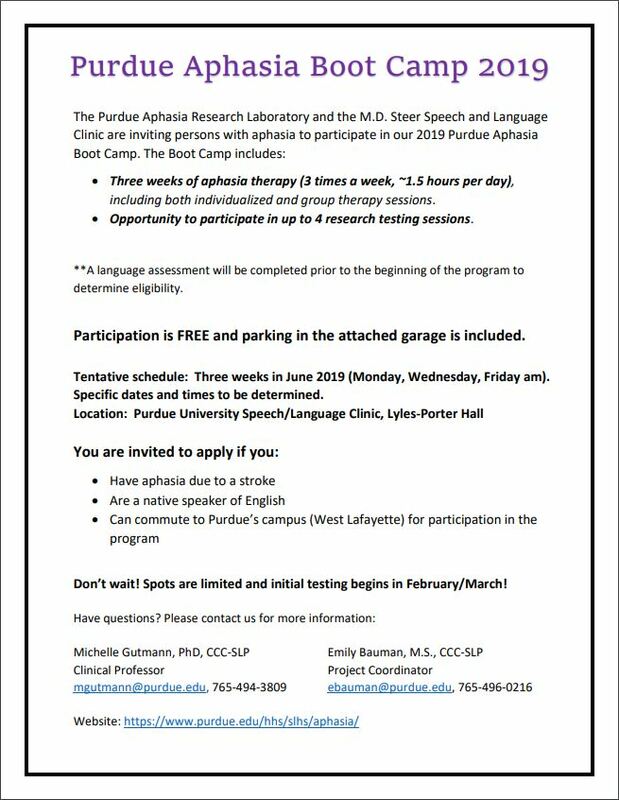 We are actively recruiting new participants for our 3rd annual Purdue Aphasia Boot Camp occurring in June 2019! Participants will receive therapy three times per week for three weeks. See flyer for details. Please enjoy the slide show including photos from the 2018 and 2017 programs.